What Is the Puerto Rican Dish Mofongo? You can't walk into a self-respecting Puerto Rican restaurant and not find mofongo on the menu. This immensely popular dish is a must-try for first-time visitors who want to sample local fare. 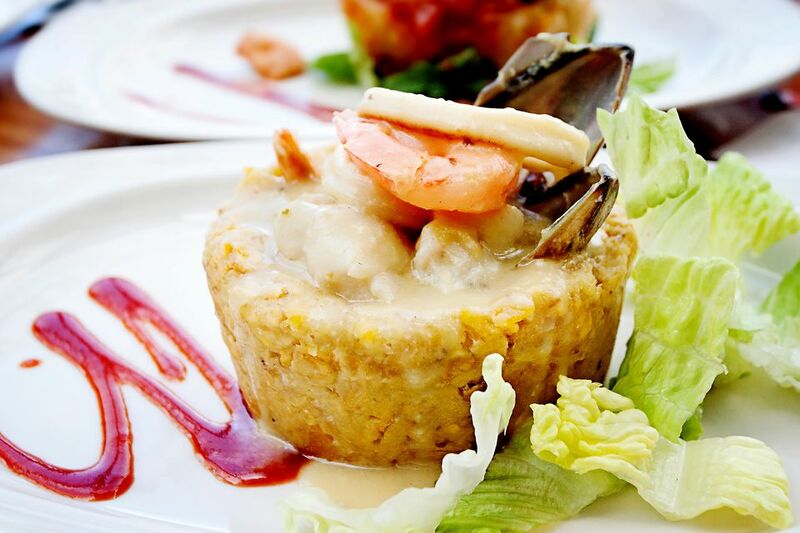 Mofongo is essentially a mashed mound of plantains into which a combination of seafood, meat or vegetables is added. It can be served as a side dish or as a main course, and it's typically accompanied by beans and rice. It's very filling, so you might want to go light on whatever your order for a main course if you have mofongo as a side dish. Puerto Rico was invaded by Spanish conquistadors in the 1500s. Puerto Rico wasn't heavily populated at the time—it was inhabited by a native people called Tainos. The Spaniards needed more manpower to settle the island than the Tainos could provide, so they brought in slaves from West Africa. It's said that these slaves introduced fufu to the island, a dish that's similar to mofongo. The Tainos adapted fufu to accommodate their own tastes and available edibles on the island, resulting in mofongo. Mofongo is traditionally made using a pilon to mash the plantains and other ingredients. The pilon is a wooden mortar and pestle dating back to pre-Colombian times. In fact, pilon remnants have been found in excavations of Taino settlements near Ponce, Puerto Rico, southwest of San Juan. Variations of mofongo are found all over the Caribbean, often going by different names. Puerto Rican mofongo is made with fried plantains, unlike the fufu de platano that's popular in Cuba. Fufu de platano is made with boiled plantains. The Dominicans also make a similar dish called mangu. Plantains—the staple of mofongo—are large, greenish banana-like fruits. Although they look like bananas, they definitely don't taste the same. If you want to try this dish at home and you can get your hands on some plantains, the process is very simple. Fry the plantains in oil (olive oil is preferred) and mash them with other ingredients of your choice. Garlic, cilantro, peppers, onions, bacon, pork, beef, chicken and shellfish are all common additions, and you might add a little broth as well. Additional oil is often added to the mashing process. Try out a couple of recipes available on Epicurious and Allrecipes, keeping in mind that this is one of those dishes that tends to be unique to its creator. You can experiment using these basic recipes as a start, adding or substituting your own variations or favorite flavors. These basic recipes use the traditional Puerto Rican inclusion of fried pork skins, but you can substitute shellfish or chicken if you'd prefer a leaner version. You can stuff your mofongo with other ingredients rather than mash them with the plantains. This results in a dish called mofongo relleno, which is then typically smothered in gravy. Substitute yuca for the plantains for an untraditional mofongo, or use both for a variation. Common Phrases to Help You Speak "Puerto Rican"